Is Your Leaky Gut Hindering Your Adrenal Recovery? In today’s video, I want to talk to you about two of the most common conditions linked to chronic health problems- Leaky gut and adrenal gland problems and their connection to Chronic Health problems like brain fog, fatigue, Gastrointestinal problems, food allergies, depression, anxiety, Thyroid problems, any problem related to blood sugar, chronic pain, chronic inflammation. If you suffer with these, It’s time to think Leaky Gut and Adrenal Glands. Very often when I am reviewing new patients records, the patient will have gone to a holistic doctor, naturopath, herbalist, etc and many times patients will have testing that shows they have a problems with the adrenal glands. Perhaps they have high cortisol levels, Low cortisol levels, low DHEA, High DHEA and based on the results of the adrenal test- the patient will have started some nutritional support, dietary changes MAYBE natural medicine to help build up and revitalize the adrenal glands. Maybe this is you? You have tried things like Ashwagandha, licorice, DHEA, adrenal glandular, B and C complex vitamins and after 4-5 months- you don’t notice much of a difference. Maybe its time to try different kinds of supplements but maybe something else is going on here? (we have Testing that shows that we have an adrenal problem, the patient is receiving treatment for the adrenal problem) the BIG questions……Why is the patient not getting better? Here’s why….it’s very shortsighted to think that with any chronic health problem that only one system is the cause of all your problems. More often than not the problem is rooted a little bit deeper than just the adrenals. And if we dig a bit deeper we find that not only do we have an adrenal problem AND we also have a Leaky gut as part of this clinical picture. It’s not that you don’t need adrenal support, perhaps you need to fix the leaky gut first and then come back around to heal the adrenals. Or perhaps there are even other pieces of the puzzle like food sensitivities, mold, heavy metals, blood sugar problems, Inflammation, etc that are also contributing- perhaps thess areas need attention first! Now I wish I could tell you that all you need to do is follow this X, Y, Z protocol to heal- but we are all different despite having similar symptoms. If you look here you can see an illustration of a leaky gut. Maybe you have seen this before and didn’t quite understand it so let me take a quick moment and explain how a leaky gut causes adrenal fatigue. At the very top you have these finger like projections- these are called microvilli- these microvilli increase the surface area for nutrient absorption. So think vitamin deficiencies… (Do you have blood work showing low vitamin D, or low iron, or low vitamin A or zinc, copper, Magnesium levels) this might be a clue that you are also dealing with a leaky gut? Next- Between the cells are structural proteins called a tight junction. These tight junction are the sites at which the gut can be compromised. These tight junctions can be attacked by an autoimmune mechanism or they can become inflamed and separated due to an overgrowth of bacterial toxins, heavy metals or some other cause- every body is different and this is why you test. Once separated- many different kinds of bacterial toxins, metabolites of medications, and undigested food proteins (called macromolecules) can be trafficked across this barrier, once they cross over this barrier they enter the blood stream and now initiate a global systemic immune system response. 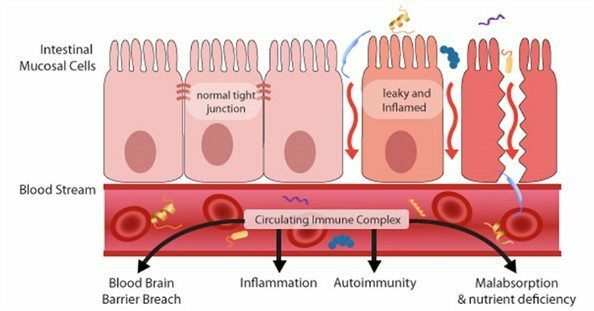 This is why you see problems with brain, problems with immune system, nutrient malabsorption and systemic inflammation. This immune response will now compromise nutrient absorption like we talked about earlier, you may start to notice that you have intolerance to smells, intolerance to jewelry, intolerance to shampoos, lotions and detergents, skin outbreaks and even chemical sensitivities to certain smells. One of the triggers behind diseases like asthma, food allergies, depression, anxiety, insomnia, and many researchers now believe that a leaky gut is the biological door to cancer and many cases of autoimmunity. I can tell you that with many of my thyroid patients we see leaky gut in about 90% of the time. What does Inflammation and Leaky Gut have to do with my adrenal glands? The gut is especially vulnerable to the presence of both acute and chronic stress. Remember at the root of all chronic diseases is an underlying inflammatory reaction. One of the mechanism by which your body regulates this inflammation is through a hormone called cortisol which is produced by the adrenal glands. Cortisol is a powerful anti-inflammatory, even when secreted at normal levels. It acts quickly to remove and prevent redness and swelling of nearly all tissues in the body. These anti-inflammatory actions keep mosquito bites from flaring into giant lumps, bronchial tubes and eyes from swelling shut from allergens, and mild scratches from looking like you just been mauled by a tiger. This is also why strong corticosteroids (prednisone, cortisone etc.) are used with all diseases involving inflammatory processes, including auto-immune diseases. These hormones imitate the anti-inflammatory effects of cortisol, but they come with all the undesirable side effects. If you had your adrenal glands tested and you had low cortisol levels or low DHEA or low pregnenolone levels, your adrenal are not able to keep up with the severity of inflammation and the amount of cortisol needed to help tame the fire in your body. If this is the case you can’t get better until you address the leaky gut and whats causing the Gut inflammation. This should make sense.- Your gut is inflamed-(again because of a number or problems) your adrenal glands tame the inflammation by cortisol, but because your adrenals are fatigued- they can’t counter the inflammation until the gut is supported. Remember Functional medicine is about getting to the root cause of the adrenal glands and unlike standard medicine that hold on to the one cause on cure belief, Functional medicine looks at the body as physiological web. I think why a lot of people fail to get better is that whoever they work with is trying to hang there hat on the adrenal glands being the primary problem. There are a couple of points I feel are super important to remember. Hopefully it is clear that when it comes to fatigue, brain fog, anxiety, blood sugar and Thyroid problems and all of the other symptoms that are often connected to the adrenal glands, that we take a step back and look at the BIG picture. So here are 4 points I want to leave you with. 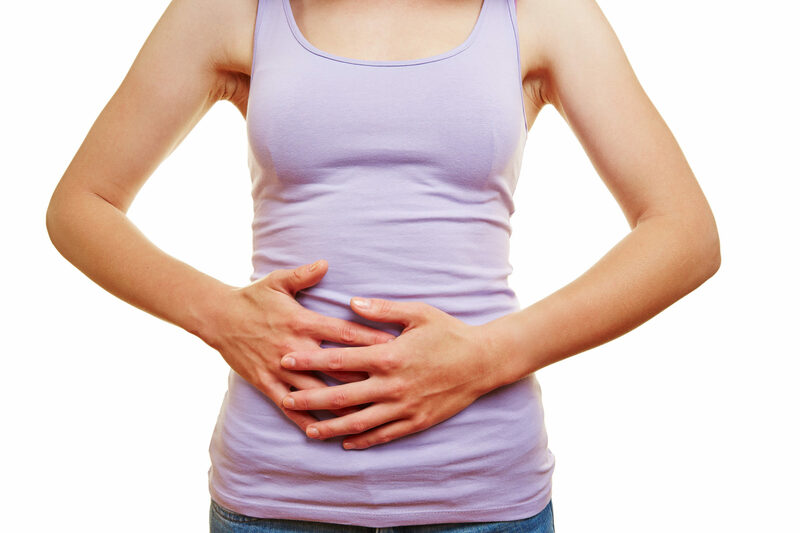 Leaky gut is one cause but there are others. If you want more to know about some of these other causes, I encourage you get my adrenal fatigue report by visiting my website. Point #4– correcting a leaky gut and adrenal fatigue requires more than just taking vitamins, herbs. You need to pinpoint the areas of your life that need a change. You can’t keep eating the way you have been and just pop some herbs and pills. Well that raps up today’s video, I hope you enjoyed it- if you did subscribe to our channel, share this video with the people you care about and most importantly don’t give up. Like I said in the beginning of today’s video- sometime you just need to dig a bit deeper.